He gives a really bad presentation about a paediatric audit. It’s all over the place. He reads from slides, but only after he struggles to find them. The final conclusion is up-side-down and his references are unreadable. But it get’s an applause!! So why do we deliver talks like this? We all think we should deliver the same – just because everyone else delivers a bad lecture at academic meetings, we think we should do the same. 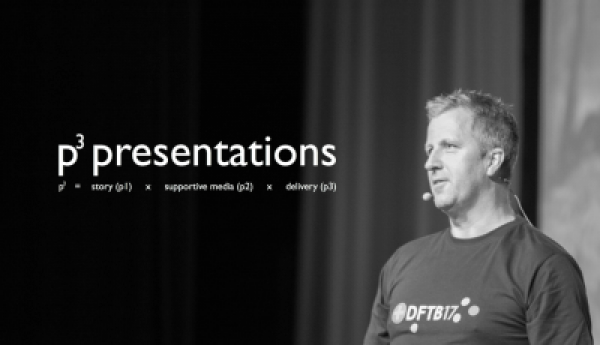 “Can you post me your presentation?” —> If you can post a presentation then it wasn’t a presentation… it’s a document. If any component is weak, the whole presentation will fail. It is cognitively impossible for the audience to not focus on text on a screen. Despite being told not to, the audience can’t help but read the screen behind Ross. He demonstrates that we are no better than a hypnotised chicken! Ross challenges us about why we feel it is necessary to read text alongside a picture. This is appropriate for 7 year olds, Ross explains. He debunks myths and encourages us to deliver presentations designed for educated adults. However, opening questions to the floor reveals a few non-believers. The first interesting questions is about natural language vs second language. How do academics from continental Europe deliver an effective presentation in English? Does text on a screen help them? Ross says no, and suggests that it requires greater processing to read, translate and speak a second language, and encourages the audience to deliver a fluid presentation without backup text. We should aim to deliver a complex message in a simple way. Ross illustrates this by taking us to his website. Although the link to his ‘How to deliver a presentation’ guide is long, it can be found by searching Google with “#htdap”. Think about the aim and the objective. These are not the same. The aim is what you want to achieve. The objective is about what the audience are going to accomplish. Ross states explicitly, don’t use Prezi! Media should be supportive – a presentation should be able to continue even if the media dies from technical failure. It should illustrate and not annotate the message. An image should trigger a response. If it’s an emotional response, studies have shown that the increase in cortisol and other neuro-transmitters leads to better retention of content. We can only follow one image at a time. Don’t confuse the viewer. Don’t ever use clip art! “If you use an image of duck stood on a toilet, it only illustrates that you are more stupid than the duck”. If you must use data on a slide, make it clear. One information point, so one number. Do not list all the other data points. No apologies. If you have to apologise for a busy slide, you have failed. If you don’t care then your audience won’t either. Pie charts are useless – they’re just fashionable now. Handouts if necessary – don’t include references on the slides, because few will write it down and fewer will look it up. Ross comes back to the podium to talk to us about delivery. He recalls a story of how a presenter was boo’d off stage at a paediatric society meeting. “Do not waste their time”, he says. Relating it back to our work, he says that if we have the confidence to tell families we are turning off a ventilator, then we have the confidence to stand in front of an audience. How much do we practice? Is your audience worth it? Think about the sport person playing an important game – they practice. Ross delivers a powerful message and reminds us that both Matthew and Christiaan will have rehearsed their presentations thoroughly before delivering it to us today. If you care about your message and your audience, turn up early and liaise with the technical team. Ask for feedback. Get an honest colleagues to watch you present and listen to their comments. Presentation Zen - https://g.co/kgs/ccQ13o by Garr Reynolds – Ross states, if you read this book and don’t like it, he will buy it back from you! Matthew delivers an outstanding presentation using the teaching points of Ross Fisher. His talk titled “How kissing a frog can save your life” starts with a story from The Brother’ Grimm, but quickly jumps to evolution. He explains he’s going to talk to us about a variety of animals and their evolutionary adaption. After introducing us to Nathan, a young boxer with a traumatic brain injury, he talk to us about giraffes, goats, dogs and ice fish. The adaptations of these animals allow them to survive in ways that would be extreme to us humans, such as massive left ventricles without ischaemia, long necks without hypoperfusion, panting dogs who oscillate their lungs. The point is that Matt delivers a fascinating talk using great examples, with names and a personal story. Christiaan attempts to teach us about haemodynamic monitoring using these new ideas. First, Christiaan talks about measuring blood pressure, and how it doesn’t represent the full picture. He uses a great example of houses collapsing in Amsterdam despite monitoring for movement every two hours. His point is that the frequency of monitoring should be more frequent. Secondly, he talks about measuring something at the right time: taking measurements after a treatment will only demonstrate regression towards the mean, as any bad or good outcomes will not be worthy of measurement (they died or got better). Perhaps the content here (albeit fascinating) is not the really important point. Christiaan is delivering a tough, academic talk without an abundance of dull slides. His points, delivered through clever, non-medical anecdotes really sink in. He told us he would talk us through 6 topics, and how they linked was not initially clear. But as the presentation continues we see how they are all cleverly linked. Christiaan keeps talking fluidly, and I don’t think he’s looked back at his slides more than 10 times. He is the presentation, and the slides illustrate his points.